Emperor Frederick I had experienced difficulties in imposing his will on the popes because they could rely on the support of the Norman kings who ruled southern Italy and Sicily. The emperor tried to weaken the popes by marrying his son Henry with Costanza d'Altavilla, a Norman princess who inherited in 1189 the kingdom of Sicily (which included also southern Italy). Pope Clement III reacted by goading some Norman barons to elect Tancredi, Count of Lecce as their legitimate king. In 1191 Emperor Henry VI, who had been elected emperor in 1189 after the death of his father, led an army towards southern Italy to assert his rights on his wife's kingdom, but he had to return to Germany to face a rebellion. Pope Celestine III recognized Tancredi as the legitimate ruler and in return Tancredi recognized the pope as ultimate lord of Sicily. 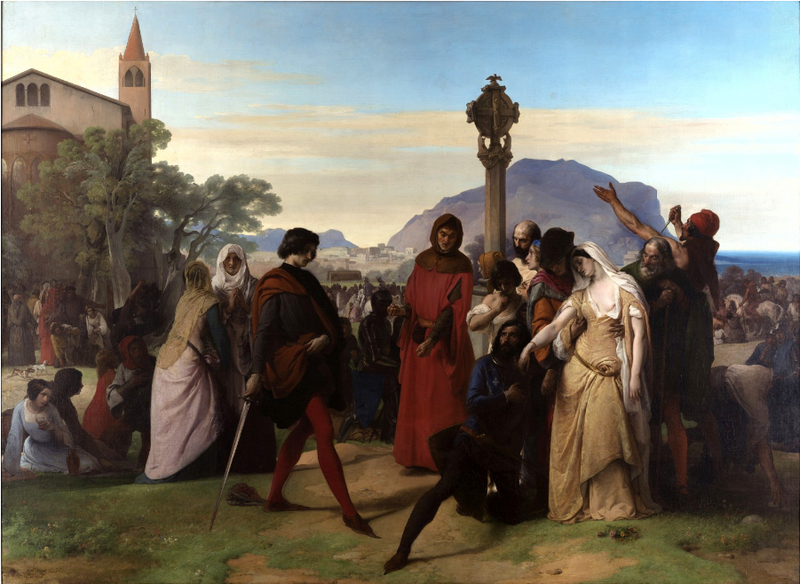 In 1194 the death of Tancredi gave Henry the opportunity to return to southern Italy, where almost all towns, including Naples and Palermo, welcomed him. On December 25, 1194 he was crowned King of Sicily. Henry detached the towns of northern Italy from the pope by granting them greater rights and he also gained the support of Genoa and Pisa, which had become strong maritime powers and which were able to move the emperor's army by sea with their fleets. Henry tried to obtain from the German princes their agreement to accept the hereditary transmission of the imperial title in order to secure for the future the union between the German empire and the Kingdom of Sicily. Pope Celestine III, who was asked to endorse the change, found several excuses for not doing so as he was aware that this union was against the papal interests. Henry died of malaria in Messina in 1197, without having been able to secure the imperial crown for his son Frederick. During the centuries which followed the fall of the Roman Empire, many ancient public buildings such as temples, theatres, arenas had been modified to be used as churches, fortified sites or just dwellings. The religious stigma associated with the pagan origin of these buildings had often led to the destruction of their decoration. 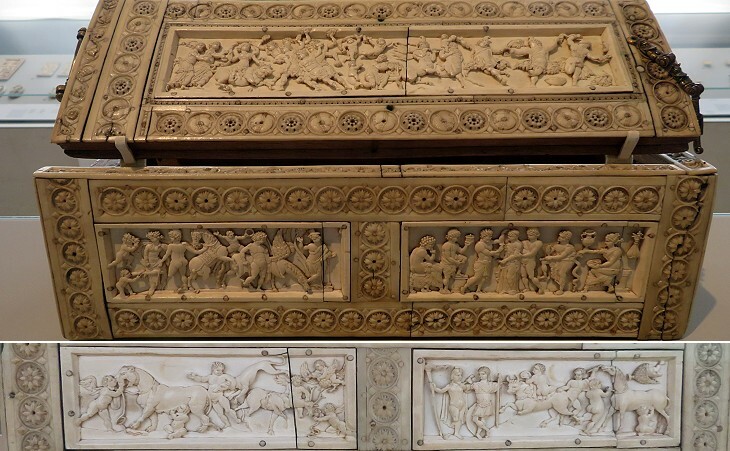 In the XIIth century a renewed attention for the memories of the glorious past of Rome changed this approach and some medieval buildings were embellished with columns and reliefs taken from the ruins of old buildings. This can be seen in Casa di Pilato and Tor Margana and in the medieval building shown in the picture: the columns and the lintel came from ancient buildings, while the capitals were new: they imitated the classic Ionian order, but the volute, the elaborate spiral scroll typical of this style, was replaced by a simpler design. The death of Emperor Henry VI was soon followed by that of Pope Celestine III. His successor, Pope Innocent III, was a relatively young man (37 yrs) who dedicated himself to establishing the theological basis of the supremacy of the church. 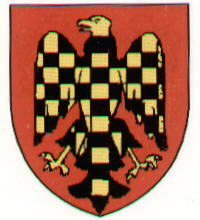 He belonged to the Conti di Segni an important Roman family and he was the first pope to have a coat of arms (a chequered eagle). He accompanied his religious acts with more practical decisions to restore the papal power in Rome and in the territories (Latium, Umbria, Marche, Romagna) which legally belonged to the pope, but were ruled by feudal lords. He profited from the clashes between the successors of Henry VI to lessen the imperial power in Italy. By calling for a crusade which in 1204 eventually led to the conquest of Constantinople, rather than Jerusalem, he saw the expansion of the papal influence in the Levant, to the detriment of the Orthodox Patriarch of Constantinople, although he had been embittered by the sack of the city. He took sides in many political conflicts throughout Europe, including Britain. He promoted campaigns against the heresies which were spreading in many European countries and he even called a crusade to crush that of the Albigenses (or Cathars) in southern France. He took care of the health of the Romans and of the pilgrims by founding Spedale di S. Spirito in Sassia and Spedale di S. Giovanni in Laterano. In 1211 he eventually favoured the imperial election of Frederick, King of Sicily, on the assumption that the young emperor would comply with his promises to support the papal action. See a famous portrait of this pope in Subiaco. 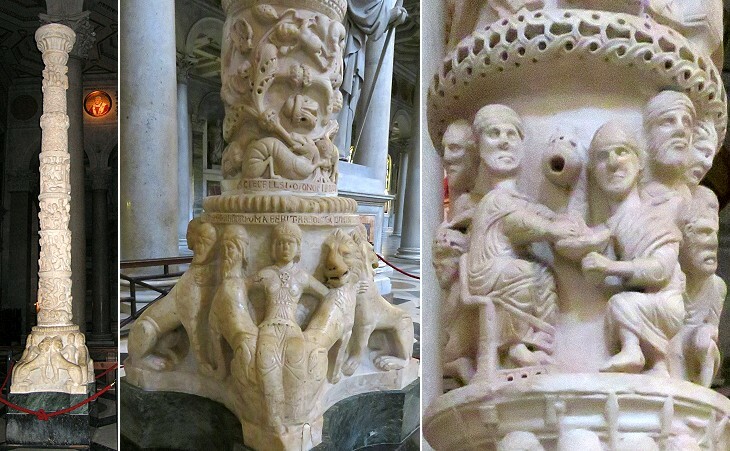 From an artistic point of view the XIIIth century in Rome was marked by the works of art of two families of marmorari (marble workers): the Cosmati and the Vassaletto. The activity of the Cosmati spread over four generations with seven known members of the family signing their works; the Vassalletto acted for a shorter period. They were sculptors and architects, but they were mainly renowned for the mosaics with which they decorated their works and in particular the pavements of many churches. The image used as background for this page shows a detail of the pavement of S. Maria d'Aracoeli. Pope Honorius III, the successor to Pope Innocent III, was a member of the Savelli, another important Roman family who had their residence on the Aventine. Honorius III was mainly involved in the promotion of the Fifth Crusade, which was led by a papal legate. Honorius vainly tried to persuade Frederick II to take part in the crusade; the emperor delayed his intervention and in the meantime he strengthened his power both in Germany and in Sicily. The crusaders seized some ports in Egypt, but without an appropriate supply line from Europe, they eventually had to surrender their conquests in order to be allowed to safely return to Europe. 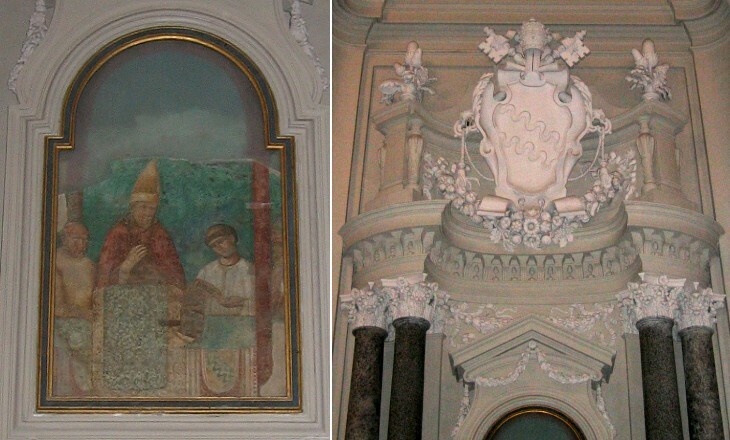 Pope Gregory IX, another member of the Conti di Segni family, was elected in 1227 at the death of Honorius III. He excommunicated Frederick II for having failed to meet his promises. Frederick at this point led his army to Acre, a port in northern Palestine which was the only remnant of the Christian Kingdom of Jerusalem. From Acre, Frederick, rather than marching towards Jerusalem, entered into negotiations with the Sultan of Egypt who had defeated the Fifth Crusade. He obtained the control of Jerusalem for ten years and he then returned home. In 1229 the pope was forced to lift the excommunication. Relations between the pope and the emperor remained tense and Frederick was again excommunicated in 1239. Frederick, in order to reduce the effect of the excommunication, formed a special armed force composed of Arab archers whom he had relocated from Sicily to Lucera, a town in southern Italy. These Muslim warriors were faithful to him as they regarded him as their sultan. In 1241 Frederick gained the support of a cardinal belonging to the Colonna family and invaded southern Latium. His army was at Grottaferrata when the pope died. In April 1217 Pope Honorius III crowned Pierre de Courtenay, a French nobleman, as the new (Latin) emperor of Constantinople. As a matter of fact Pierre de Courtenay never managed to reach Constantinople as he was attacked on his way there by a Byzantine prince who took him prisoner. The coronation however was seen by the pope as a very remarkable event: for centuries the papal appointments had been endorsed by the Byzantine emperors and now the reverse was occurring. The coronation did not take place in St Peter's, but in S. Lorenzo fuori le Mura: while St Peter's is located to the west of Rome and was used since the time of Charlemagne for the coronation of the western emperors, S. Lorenzo is located to the east of the city and so Pope Honorius III thought this basilica was more appropriate for a ceremony involving an eastern emperor. In this way he also stressed that there was a plurality of emperors and that they all derived their power from the pope. At the time S. Lorenzo was a relatively small basilica built in the VIth century; it could not be compared with St Peter's. 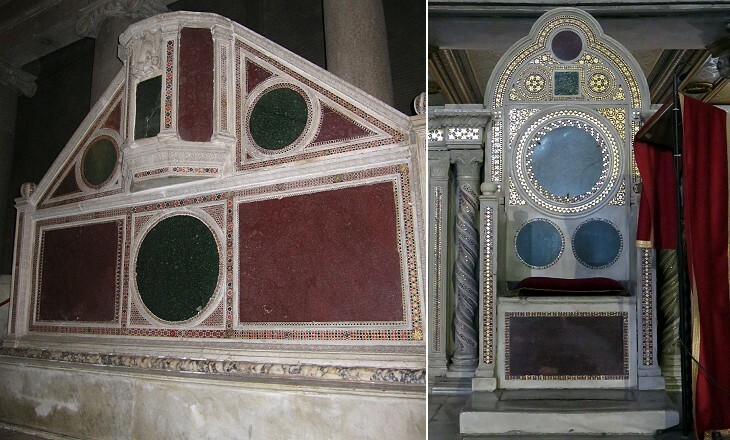 Pope Honorius III decided to enlarge and embellish it and the basilica we see today is composed of two sections which are slightly misaligned. 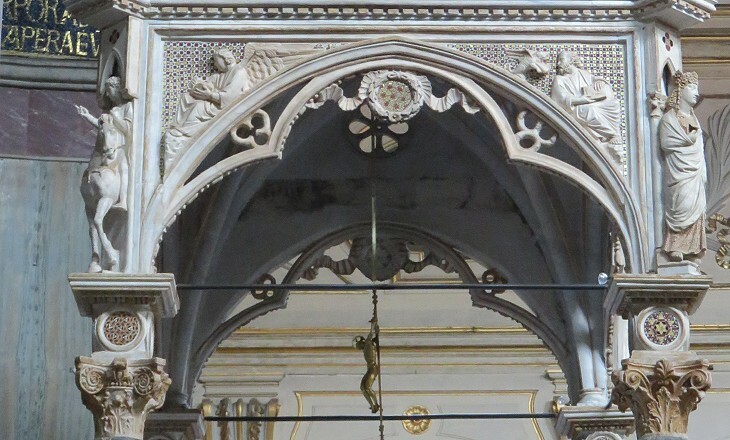 S. Lorenzo was embellished with several works by the Cosmati family to make it the appropriate setting for future coronations of the eastern emperors: contrary to the papal expectations there were no other coronations and in 1261 Constantinople was retaken by the Byzantines. The Cosmati works of art were particularly appreciated at the end of the XIXth century in the frame of a general re-evaluation of medieval art (see a page showing early XXth century paintings and drawings showing these works of art). The power of Frederick II was such that the cardinals found it difficult to appoint a new pope willing to renew the confrontation with the emperor; after the appointment of a pope who died 17 days after his election the papal chair remained vacant for two years until Frederick released two cardinals he held prisoners. Innocent IV, the new pope, belonged to a Genoese Ghibelline family and Frederick was pleased with his election, but the emperor was soon disappointed. Innocent IV fled to Lyon in France, placed himself under the protection of Louis IX, King of France and held a council which deposed the emperor. Frederick however managed to retain his power and in 1250 he even threatened to invade France and capture the pope who had never left Lyon. The death of the emperor in December of that year radically changed the political scene: the pope was determined to break the link between the imperial crown and that of Sicily and he offered Sicily to the brothers of the kings of France and England. Emperor Conrad IV, son of Frederick II, managed to dissuade these royal princes from actually trying to conquer Sicily (and southern Italy), but his sudden death in 1254 reopened the question. Manfredi, an illegitimate son of Frederick, claimed for himself the Sicilian kingdom and acknowledged the papal supremacy. Pope Alexander IV, a member of the Franciscan order elected in 1254, vainly continued a search for a pretender to the Sicilian throne, who was willing to lead an army to conquer it. His French successor Pope Urban IV was luckier: he directly offered to Charles of Anjou, brother of King Louis IX, the crown of Sicily. Charles was determined to have a kingdom for himself and accepted the papal offer. Pope Clement IV (another French pope who had been elected in 1264), in January 1266 crowned in St Peter's Charles as the new King of Sicily. In February 1266 the French, called Angevins after the county of their leader, defeated the mainly Arab army of Manfredi at Benevento. Charles then moved southwards and easily conquered Naples. In 1267 the young Conradin, son of Conrad IV, relying on the revolts which had occurred in several towns of southern Italy against the Angevins, with a small army crossed the Alps. In July 1268 he entered Rome but his hopes to regain the kingdom vanished at Tagliacozzo, where Charles won a decisive victory over him: the young emperor fled towards the coast to try to return to northern Italy by sea, but at Torre Astura he was betrayed by the Frangipane, lords of the castle, and he was delivered into the hands of Charles, who put him to death in a central square of Naples. The popes had at last broken the German encirclement of the papal state, but they soon realized that they had moved out of the frying pan into the fire. The response of the Church to the spreading of heresies was not limited to the use of force; it also relied on the convincing action of the members of two religious orders founded in the XIIIth century by St Dominic and St Francis: the Dominicans were members of the Ordo Praedicatorum, Order of Preachers and preaching was one of their main activity: it is most likely owing to them that pulpits became so important that they were richly decorated; the order was granted permission to act by Pope Honorius III in 1217. A few years earlier in 1209 Pope Innocent III had granted authority to the order founded by St Francis of Assisi: the pope had at first regarded the preaching of St Francis with suspicion because his call for poverty and humility seemed an indirect criticism to the political role of the pope. The first Franciscan convent in Rome was located at S. Francesco a Ripa, a small building in a remote location in Trastevere, but the new order grew so quickly and became so popular that in 1249 Pope Innocent IV granted the Franciscans the church of S. Maria d'Aracoeli which was located near the town hall on the Campidoglio hill. The church was largely rebuilt and work ended by the end of the century: it became (and still is) very dear to the Romans. In many parts of Europe the erection of a large cathedral had been the symbol of the wealth and importance achieved by the town. In Italy these cathedrals were (and still are) more familiarly called duomo, after the Latin domus (house). In Rome the large basilicas could not be regarded as a duomo, notwithstanding their size and magnificence, because they were too remote from the city centre. S. Maria d'Aracoeli, which was visible from every corner of Rome, became a sort of duomo of the Eternal City. Charles of Anjou was an ambitious man and from being a vassal to the pope he soon became the lord of Rome placing his men at the head of the administration of Rome (he had been appointed Roman senator by Pope Urban IV). Pope Clement IV died in Viterbo without having ever been able to set foot in Rome. The election of his successor took place in the papal palace of that town. The conclave lasted almost three years, until the inhabitants of Viterbo destroyed the roof of the palace to hasten the cardinals' decision. The cardinals were split between a party in favour of a candidate chosen by Charles and a party who wanted to react to the growing influence of the Angevins. Pope Gregory X was eventually elected and he tried to counterbalance the Angevin influence by soliciting the German princes to appoint a new emperor, thus ending the period of confusion which had followed the death of Conradin. Rudolph I, the new emperor, was a member of the Habsburg family who with him rose for the first time to a leading position on the European scene (see some pages on Vienna, city of the last Roman emperors). Charles of Anjou had to accept the papal decision but in the following years he managed to influence the next papal elections so that the choice of the cardinals always fell on very old and ill persons who could not challenge him. In 1277 however the cardinals elected Pope Nicholas III, a member of the Orsini family, who was very hostile to the king. He tried to pursue a policy of balance of power and he also issued rules to be followed during the conclave in order to limit the influence of external powers. At his death in 1280 Charles favoured the election of a French cardinal who became Pope Martin IV; the new pope endorsed the ambitious plans of Charles to restore the Latin Empire of Constantinople: Charles was preparing an expedition in Greece, when the Sicilians rebelled against his rule. The 1282 Sicilian Vespers, maybe prompted by the gold of the Byzantine Emperor Michael VIII Palaeologus, ended with the massacre of thousands of French officers throughout the island. Charles remained in control of the mainland part of his kingdom, which was then called the Kingdom of Naples, but without Sicily his power was greatly diminished and he had to abandon his expansion plans. The two following popes, Honorius IV, another Savelli, and Nicholas IV, had little to fear from the Angevins; King Charles II who had replaced his father in 1285 was too busy fighting the Spanish (from Aragon) dynasty who had taken possession of Sicily. Pope Nicholas IV devoted himself to the embellishment of Rome: he relied on three great artists. Jacopo Torriti designed the mosaics of the apses of S. Giovanni in Laterano and S. Maria Maggiore. Piero Cavallini decorated with mosaics S. Maria in Trastevere and with frescoes S. Cecilia (other works are lost). Arnolfo di Cambio, in addition to several statues, including a famous bronze statue of St. Peter (external link), designed the ciboria of S. Paolo fuori le Mura and of S. Cecilia. Pope Boniface VIII is one of the most controversial figures of the history of the church: Dante placed him in Hell and called him Lo principe de' novi Farisei (The Leader of the modern Pharisees) (Inferno, Canto XXVII, 85) because the pope was thought to have sold for his own profit pardons and other ecclesiastical privileges and to have convinced with malicious arts his predecessor Pope Celestine V to renounce the papal throne (Dante placed in Hell most of the popes and monarchs discussed in this page). These charges were part of a smear campaign promoted by Philip IV the Fair, King of France. 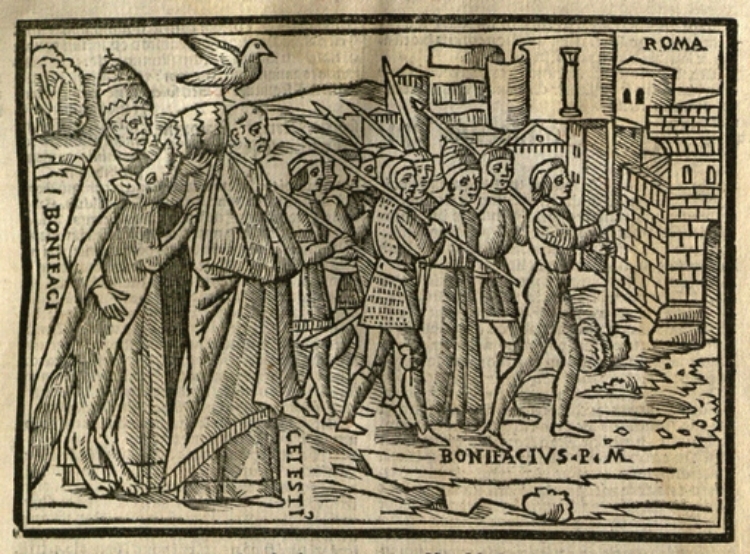 Boniface belonged to the Caetani, a powerful Roman family who had control of the town of Anagni: the pope favoured his family to the detriment of the Colonna, whose fief of Palestrina was destroyed by papal troops. Two Colonna cardinals fled to France where they started to plot against the pope. Pope Boniface VIII pushed the papal claim of supremacy over all the temporal leaders to its extreme. His conflict with the King of France arose from not very spiritual causes: a matter of taxation rights which due to the stubbornness of the two leaders led to an open confrontation: the pope claimed that the king should submit to his decisions, the king claimed that the election of Boniface was unlawful. The conflict between the pope and the king was accompanied by a parallel fight between the Colonna and the Orsini. In their long quarrels with the German emperors, the popes exploited a weakness of their adversaries: the fact that they were elected and that, once they had been excommunicated, that election became null. Boniface did not realize that Philip was in a different and stronger position: an excommunication did not impact on his right to the throne, as it did for the emperors; the French clergy and most of the French cardinals remained loyal to him. In addition the conflict with the Colonna weakened the position of Boniface even in Rome. In September 1303 Guillaume de Nogaret, a close adviser to the king, and Sciarra Colonna led an assault to the papal palace at Anagni and took Boniface prisoner: according to the traditional account Sciarra Colonna slapped the pope in the face. The inhabitants of Anagni reacted and freed the pope who with the help of the Orsini returned to Rome. A few days later Boniface VIII died owing to the stress and bitterness caused by the affront he had experienced and by the realization that his policy had failed. In 1291 the last trace of Christian rule in Palestine disappeared due to the fall of Acre into Muslim hands. Pope Boniface VIII realized that a tenth crusade would not have achieved what the preceding ones had failed to do. Pilgrims went to Jerusalem because of the indulgences granted to them (a remission of their punishment in purgatory due for sins); the pope decreed in a bull issued in February 1300 that sinners would be granted special indulgences if they visited in that year the city of Rome and the tomb of St Peter, Prince of the Apostles. He declared the year 1300 a holy year: it was the first Christian Jubilee. By this decision the pope achieved several objectives: by replacing Jerusalem with Rome he put an end to the crusades which had drained resources and because of their repeated failures had had negative impact on the image of the popes who had promoted them; he emphasized the figure of St Peter upon whom the papal role was based; he granted to the City of Rome and to the Church a significant economic benefit. In his decree Boniface established that Jubilees should occur every hundred years, but already in 1350 another Jubilee was announced and eventually it was decided to have a Jubilee every 25 years so that each generation could attend one of them. The Jubilees had a great importance for the urban development of Rome; new streets, bridges, churches, hostels were built for these events. 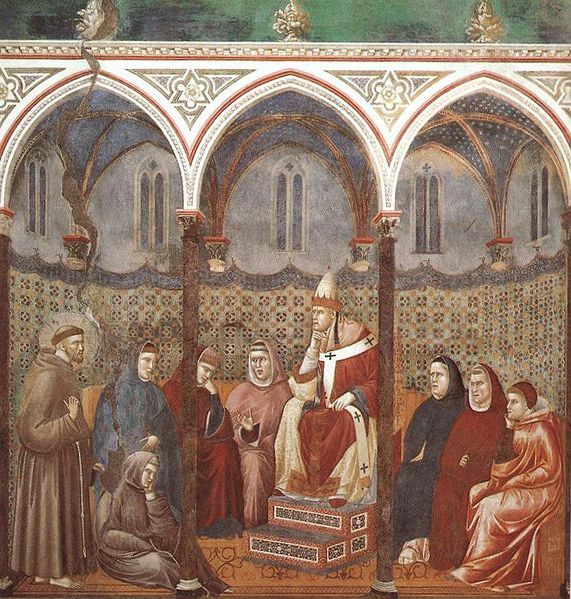 St. Francis Preaching before Honorius III by Giotto (1267?-1337) in Assisi. Frederick II in Jerusalem, medieval miniature. 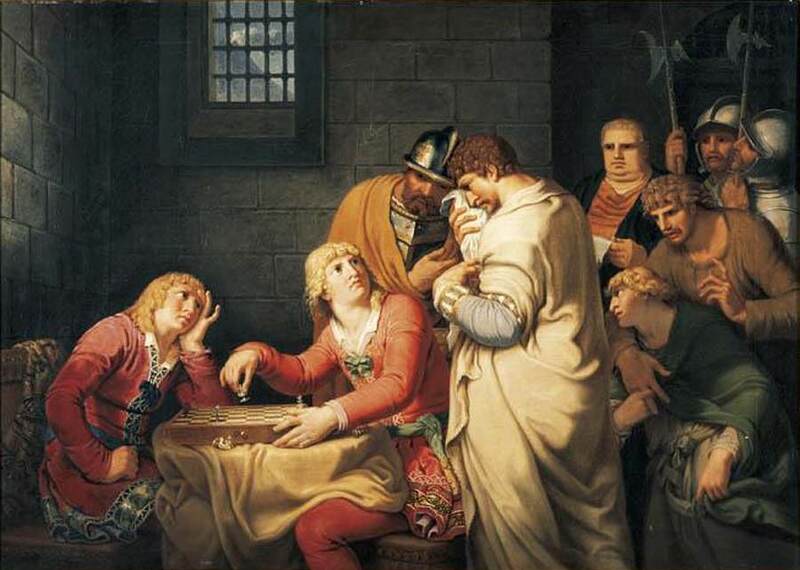 Conradin of Swabia Being Informed of His Execution by J. H. W. Tischbein (1790), a close friend of Goethe. 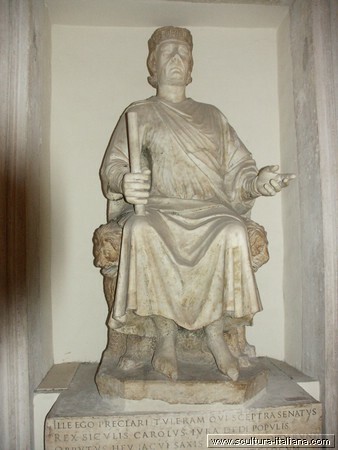 King Charles of Anjou portrayed as a Roman senator, statue by Arnolfo di Cambio (1245-1302). The Sicilian Vespers by Francesco Hayez (1822). The Sicilian Vespers opera by Giuseppe Verdi, 1951 performance starring Maria Callas. Pope Boniface VIII pulling the papal tiara off Celestine's head and being arrested by the Colonna, XVIth century engraving.